A while back I made something for one of my class projects. It was a class magazine, and I decided to write up something for the review section. 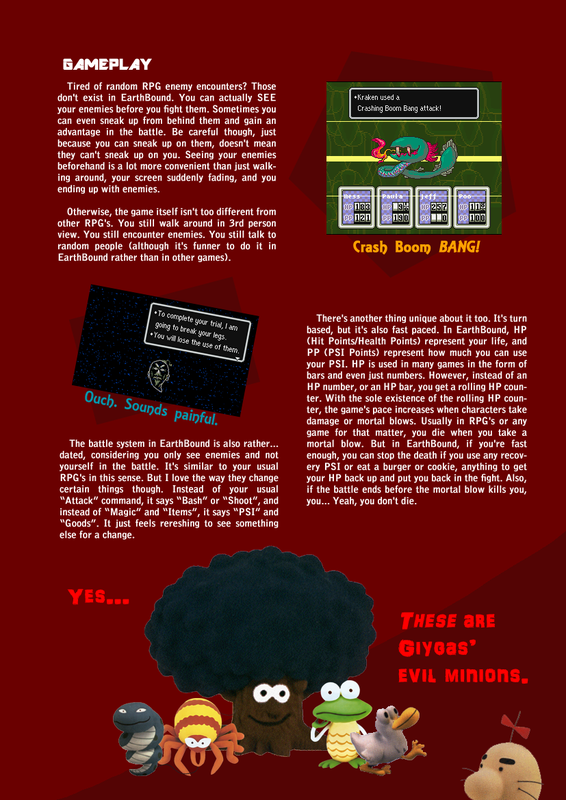 Well, yeah, I reviewed EarthBound. I designed it myself, except for the clay models of course. 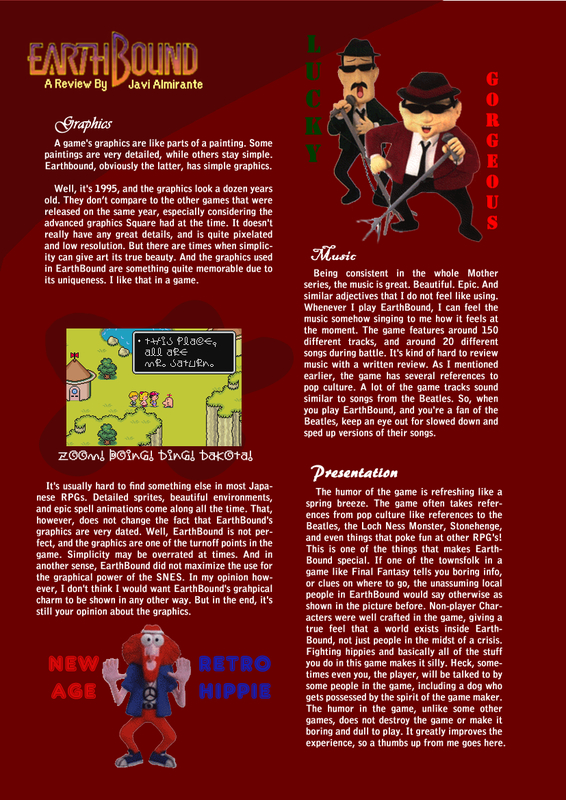 It’s not that great, and I wonder about other people’s EarthBound related projects… By the way, it’s 4 pages long. That’s actually pretty slick looking for a class project! I’m sure people will have different opinions about the review score and all that stuff, but the overall score seems fair to me. I totally agree with IWANNAPIZZAAIRFRESHENER. And damn near every snes game ends up using a pallet switch for enemies at some point or another. Other than that nice work! Bad review. The Screenshot is missing. When I was a kid playing it for the first time, I thought the graphics were good actually. Here are the scores I gave to EarthBound. Story: 8.5 Seems simple at first, but becomes deeper later in the game. Gameplay: 8 Sometimes boring, but many hilarious and fun parts make up for it. Graphics: 8.5 Underrated, imaginative, and sometimes reminds me of South Park. Sound: 9 Sound effects are annoying, music is awesome except for some battles. Cast: 10 Memorable, quirky characters you actually seek out to talk to them! Lasting Appeal: 8 The ending and the beginning flow together really well, so it makes one want to play it again. However, I think it drags around Fourside. nice job. i should have thought of it myself. i give you a 9.5. @Portal-Kombat, what do you mean by “it drags around Fourside”? I ask because it must be something major for you to knock off 2 points. Psssh, 10/10 for me. Best RPG I’ve ever played (And I’ve played alot of RPGs). Yeah, i’d say that’s a fair assement. I could never, in any good consciousness give Earthbound a perfect ten for any reason, simply due to the presence of games that were always much better and technically superior to it in a lot of ways. earthbound has always been sort of “the little underdog that could” of RPG, but when viewed fairly, it’s just not up there. Personally, though I love earthbound for reasons relating to it’s story, it’s characterization and it’s tone which are all masterful, I always felt the game barely deserved more than a 7.0. I think the game is very good in it’s look and feel, and particularly it’s characterization but it has many flaws that really drag it down, a lot. In essense, Earthbound is an emotional experence unlike any other (Until Mother 3 came along). On the other hand, on the technical aspect of things, it is a rather generic RPG system, that is miles behind other games of the era. The battle system was woefully outdated for it’s day, and as an RPG on simply the RPG level, it is standard, at best. It is simply not any more well constructed than one of the more primitive Dragon Warrior games from the NES when it comes to it’s core gameplay. I never thought the graphics were a problem. I feel Earthbound’s greatest weakness is that it takes it’s unique and amazing world and plops it into an RPG system that is both dull to play through, and adds or innovates practically nothing aside from a rolling HP counter, which, if you think about it, really adds nothing at all to the real gameplay instead of just being kind of cool looking. The characters and the quirky and lovely world more than makes up for these faults, almost singlehandedly giving the game all 7 of it’s points out of 10 that make the game unforgettable and emotional. Playing it all the way through, however, can feel tedious since again there’s little strategy or innovation outside of a basic Dragon Warrior title. Gameplay-wise, if you ignore the humor, wit, charm, and emotional value, Earthbound has nothing on he techinal gameplay side that Square-Enix hadn’t done and done much better with games like Final Fantasy 6 and Chrono Trigger. 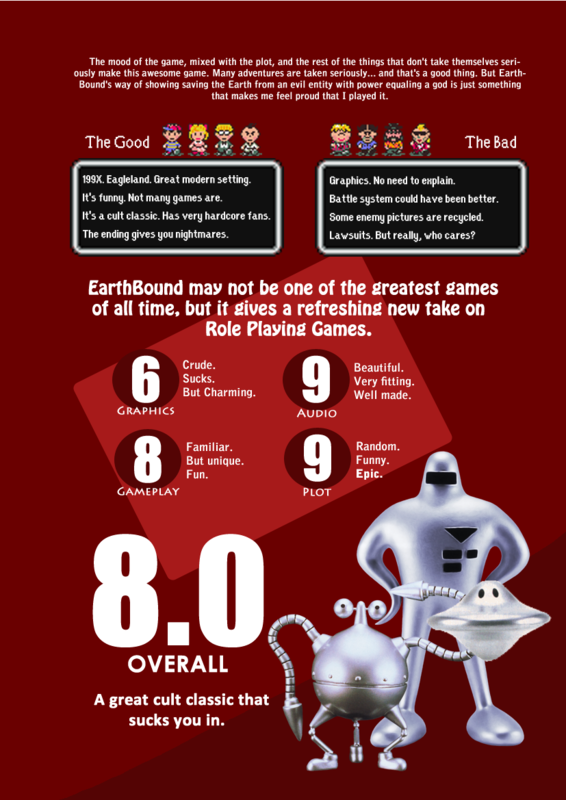 Therefore, it just can’t be rated anywhere near as high as those, although Earthbound does undeniably have a place as an underdog and recgonized for a game that does have a large fanbase and does deserve that fan-base. If Earthbound had an innovative RPG gameplay system in place that lived up to it’s near limitless charm, then it might have very well been one of the greatest games ever, but in actual it’s gameplay is just as shallow as it’s world is unique, which really unbalances the game’s potential. That is, when someone looks at the game FAIRLY as opposed to blindly nostalgic. Which is sadly, how this game is looked at, with it’s reputation, and most, blindly giving it a 10 out of 10 score that it really doesn’t deserve. Earthbound, in my view is really good. Not great, not a masterpeice, but just good. It does however coast along entirely on the value of it’s charm, but ultimately doesn’t have the substance that other games of it’s era have. Earthbound, to me, is like a game that wins you over with it’s dazzling smile, and charming personality and then is somewhat shallow on the inside. You can learn to live with it’s flaws and outdated, un-innovative gameplay because it’s charming, cute, and touching in it’s own way, but I never really found it to be a fulfillin GAMING experience. Just an emotional one. To be a well-rounded game or to truly deserve a 10/10, a game has to have BOTH. Earthbound has one. It does one extremely well which makes up for exactly half of it plus an extra 20% for it’s beauty and charm alone, but it still only has one. Hence where I think the game basically earns a 50% for charm alone and an extra 20% for the sheer beauty of it’s smile. But the rest that would figure into it’s gameplay is nonexistant since it’s woefully behind what other games have done vastly better. 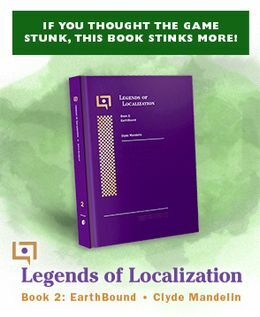 Earthbound needed to push the boundries of an RPG and go beyond other games, not just in the emotional factor, but in the gameplay department. It refuses to do that and does kind of suffer for it. Fanboys may not like that review, even though i’m still saying it’s an important, good, and enjoyable game despite glaring flaws. But I could never logically say this game was a little bit beyond average, especially for it’s day. EarthBound is 2nd best game I’ve ever played, the 1st place goes to Chrono Trigger. 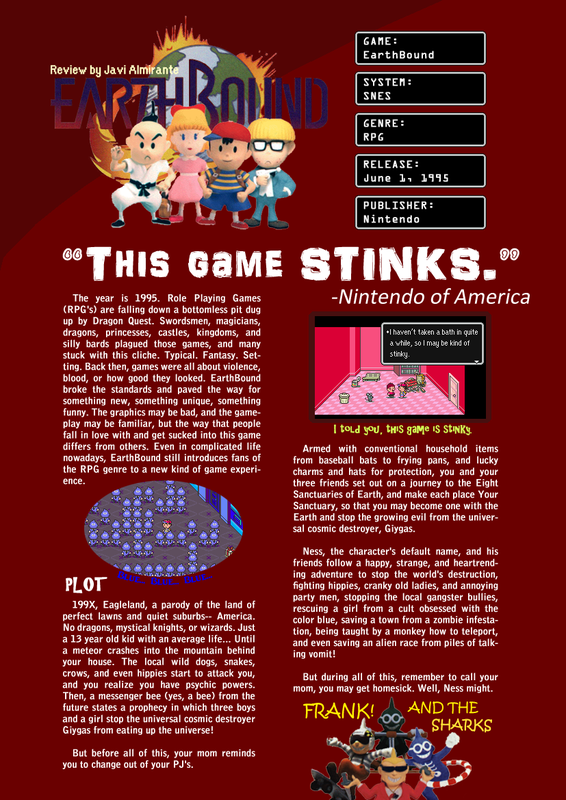 PKSTARMAN – NOA were latching on to the fact that you can fight weird, smelly creatures like piles of puke in EarthBound. They weren’t saying that EB stinks as in it’s a terrible game, but it can certainly be interpreted that way. I think at the time, they were trying to cash in on the fad of gross-stinky things and it backfired severely. Think back to Gak and Silly Putty, Creepy Crawlers and that Dr. Dreadful brains and body parts making kit thing. There were others, but you get the idea. Wow I find it funny how he rated the game graphics badly. It was made in 1994-1995 So he should try thinking in his head how graphics were back then and not now. ^ I think he already was. When you compare EB to other games released at the time (Chrono Trigger, Super Mario RPG, Donkey Kong Country), EB’s graphics definitely leave a lot to be desired. EarthBound’s graphics are unique, cute, and awesome, and any other way would’ve just made the game lame. It’s very beautiful and colorful. It fits the game the way it needs to. Hahaha. EarthBound gets a 10 from me, but as a reviewer highschool student dude, I can’t just do that. are you sure this is a school project? are you positive this isn’t a magazine clipping or something? but seriously, this is the nicest review of earthbound i’ve ever read. you identify all the good points and the bad points perfectly. this is great. Does Picky remind anyone else of Numbah 4 from Kids Next Door? I agree with you Javi. People always comment on how the gfx are below average. They are missing the point. EB is a highly stylized game, and it would really look kind of retarded to have like super realistic ala chrono trigger graphics in my opinion. Haha, maybe I should’ve given the game a 7 or 8 instead of 6 in the graphics part. But what truly makes EarthBound a great game is the way that the game absorbs you into its world, and makes you a part of it, not just a person controlling characters, not just a person being dragged by a plot, but a member of the game itself. i wish i could do that for my project. I should do something like this for my high school newspaper.